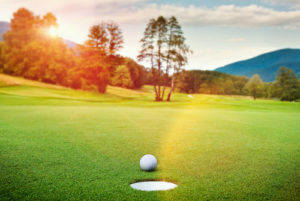 Are you itching to play some golf in Southern Maryland? Calvert County is the perfect place to work on your consistent golf swing. Pull out your 7 iron, set up your tee time by the water and start swinging! Come with us as we explore the top 5 golf courses near Calvert County Maryland! 18 holes are awaiting you at Chesapeake Hills! This public golf course is open to all looking to sink a hole in one. They are located in Lusby, Maryland, just minutes from Solomon’s Island and offers a wide array of greens for golfers of all levels! Old South Golf Course is located in Lothian, Maryland. Situated in the rolling hills of Anne Arundel County, this 18 hole golf course was designed in 1990 by Lindsay Ervin. Just 30 minutes from Washington D.C., the course boasts five sets of tees ranging from 6779 yards to 4476 yards. Old South was honored to host the 2012 Maryland Open and the 2007, 2008 and 2009 qualifying events for the Nationwide Tour’s Melwood Prince George’s County Open. These credentials surely merit your attention! Rated by golfweek.com as one of the best golf courses you can play in Maryland, Lake Presidential has so much to offer those looking to tee off! This Championship caliber golf course has a scenic 30 acre lake and an 11,000 square foot club house. 18 holes of pristine golf greens awaits after you spend time training with the pro’s at “The Institute” Training Center to get you a more consistent golf swing! Oak Creek is nestled in the shadow of the Nations Capital, possessing a Par-72 Ault-Clark design! The PGA trained instructors here can help you to understand full-swing, short-game and putting fundamentals. About 7,000 yards of course gives you plenty of elbow space to swing that 7 iron! And our Winner is Cedar Point! This picturesque golf course lies right on the Patuxent River, situated on the Pax Naval Air Station. This par 72 championship course is over 6,000 yards long! The views of the Chesapeake Bay and the Patuxent River from this golf course are amazing! The course amenities include a Pro Shop, PGA Instruction, Mulligans Grill, two practice greens, two practice fairways, a target green and a driving range. At Calvert County Roofing, we appreciate a nice round of golf after a hard day of work! Just remember, if your going to swing the club on the green, let somebody else swing the hammer… on your roof! Check out our next blog about the Calvert Cliffs Nuclear Power Plant!